Ahh, the sweet indolent unguence of summer fruits. It is not, per se, summer-like around Mad River Road (I am freezing, the cows are blowing steamy clouds and it's technically fall), but up in Orleans, around Willow Creek and down in Shively the sun shines on unhindered by shivery fog, and crates of drippy fly-tempting summer fruits from there have been making an appearance. This coincides nicely with a) BBQ season (I wear a sweater) and b) the wonderful affinity of grilled meats and fruit-based sauces. I adore Georgian cuisine because apparently in Georgia (Russian Georgia, not peaches Georgia) you can't swing a cat without hitting a fruit- or walnut-based sauce, which is high livin' in my book. But Georgian cuisine does not have the last word in fruit-based sauces; think chutneys, for instance. A dish sounds more palatable when you call it that (though chutneys are often more fiery). But that's just splitting hairs. Fruit-based sauces provide such a lovely, sticky, sweetish flavor opposite the smoky, salty, almost cindery taste of barbecued meat, and are a sophisticated re-up on supermarket BBQ sauce, which in essence is a highly sweetened fruit-based (tomato) sauce, after all. As in most simple fruit dishes, the defining factor is your fruit. Unlike a syllabub, if you make a savory sauce with mediocre fruit you can't try to make up for flavor by smothering it in whipped cream. The fruit needs to be good. I discovered a nice way of circumventing unfortunate fruit a few weeks ago when I tried to make a rhubarb chutney for a nice local pork leg and the rhubarb was over-mature and dissolved into stringy bits rather than jammy lumps. I had already added my nice fresh stock, so it seemed a shame to waste all that flavor. Instead I strained the liquid and used it to braise onions, brokering a happy marriage of ingredients that are respectively sour and sweet. Really, fruit is very versatile. Even in winter, a simple and luscious sauce for seared duck breast can be made by boiling a half cup good apricot jam, a spoonful of red wine vinegar, a cup of chicken stock and some s and p down to a syrupy pour. And of course fresh fruit salsas are excellent on grilled fish -- minced mango, cilantro, onion, lemon juice and a little jalapeno are great on salmon. But for roasted meat I like a nice cooked compote. 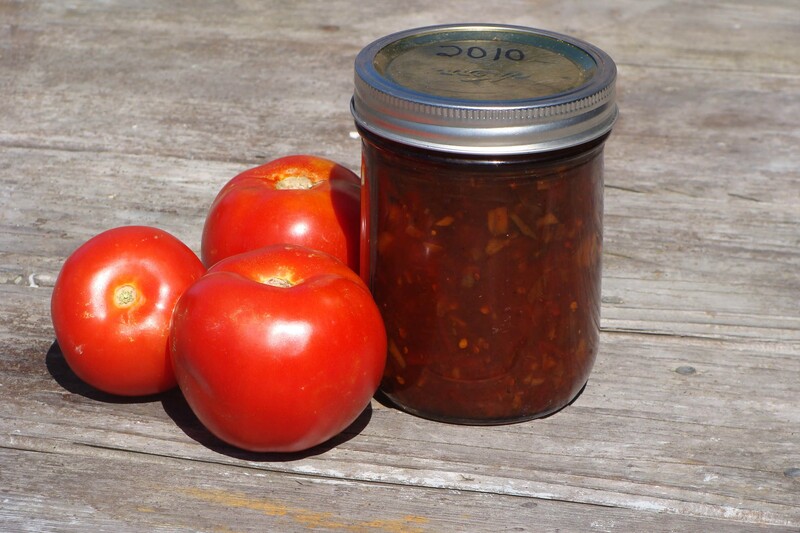 Canned chutneys are a good way to use surplus tomatoes that aren't nice enough for salads. They take longer to make but you can use them all winter and remember that one week it was hot in Humboldt. Best Chut Ever (adapted from The Yogi Cookbook by Yogi Vithaldas and Susan Roberts). My mother has been making this chutney since I was a screaming bairn. Now Willoughby and I make it with Shively tomatoes. Good with everything ever, from curry to grilled trout to avocado sandwiches. Pound garlic, ginger and salt to a paste in a mortar. Heat all ingredients to a simmer in a deep saucepan. Cook about an hour on medium heat, stirring occasionally -- till jammy, anyway. Cool, can and store. Can be used immediately but improves with time -- a month is good. Delicious. Make a pork roast in the oven, or grill thick chops or a thick slice of leg over a moderate fire. Brining the pork in advance is beneficial. Otherwise, be sure to salt the pork on all sides before cooking. Cut into beautiful slices and pour this sauce over them. Cook rhubarb in water with sugar until completely soft. If it still has unpleasant bits of fiber, force through a strainer. Sauté onion in butter slowly, stirring often, until golden, about 7-10 minutes. Combine with cooked rhubarb. Add cumin and vinegar. Simmer until well reduced and thick, adding stock for bonus flavor. Taste and add salt and pepper as needed. This is from that most stellar of cook books, The Georgian Feast by Dara Goldstein. I've made it for friends, serving it on roast chicken in winter with frozen summer berries and it was much lauded. It is also very pretty and jewel-colored. Mush the berries through a sieve. Using a mortar and pestle, pound the garlic, salt and hot pepper to a paste and add to the sieved blackberries. Stir in the minced herbs and lemon juice. Serve at room temp.